Do you own more than one iPad? Do they both have AT&T 3G capability? If so, beware. AT&T may become confused about your setup and charge you for a 3G plan you neither want nor have. I know this is so because it happened to me. When the iPad 2 came out, I bought one. It was an AT&T Wi-Fi + 3G model, exactly like the original iPad I still owned. I had used the 3G capability of my original iPad only occasionally. After initially setting up an account, I purchased a data plan and renewed it for the next two months. I then discontinued the plan, re-enabling it, usually for just a month at a time, whenever I needed 3G access. At the time of my iPad 2 purchase, the 3G data plan on my original iPad was dormant. On March 20, I made an initial purchase of a 3G plan on my iPad 2. I set up a new account, using the same e-mail address I had used on my original iPad. The AT&T representative that I subsequently contacted about this matter told me that this should not have been possible. He claimed that an e-mail address can only be associated with one iPad at a time. As my initial account still existed (even though it was not active), I should have been required to use a different e-mail address with the iPad 2. Either the rep was wrong or AT&T somehow made an exception for me. However it happened, my single-address/two-iPads setup may have been the precipitating cause of the problem that soon appeared. Or maybe not. No one, including the AT&T rep, appears to know for certain. In any case, the iPad 2’s 3G activation succeeded. I used it for a few days while on a trip. A week or so after returning home, I decided to cancel the automatic renewal of the plan. When I attempted to do so, it appeared that I no longer had an active plan to cancel! My iPad 2 could not connect to the Internet via 3G. Further, when I went to Settings -> Cellular Data -> View Account, there was no indication I had ever previously set up an account. AT&T was asking for my name, address, and credit card information all over again. Initially, I thought I must have already cancelled the plan and forgotten. However, I did find it odd that my account was apparently gone, instead of merely inactive. That would not have been my intent. But I figured “who cares at this point?” If necessary, I would worry about what it all meant when I next wanted to purchase a 3G plan. This was the end of the matter for now. Or so I thought. After you log in, this is what AT&T’s cellular data account screen should look like when you have an active data plan. On April 20, I received an e-mail from AT&T congratulating me on my successful “auto-renew of DOM 250 MB for 30 days.” Huh? I went back to my iPad 2 to see what was going on. Nothing had changed. I still had no 3G connectivity and there was no indication of an active account. So what exactly was AT&T renewing? It was clearly time to call AT&T Customer Service and get this sorted out. When I explained the situation, they were similarly perplexed and unable to explain exactly what was going on. They did confirm a record of me having cancelled my plan (although they were murky about the details). Yet they confirmed I also had an active account that had just been renewed. That’s when the nickel finally dropped. With the agent still on the phone, I pulled out my original iPad. Sure enough, it had an active 3G connection! Apparently, somehow, the 3G plan that I had activated on my iPad 2 had been transferred to my original iPad. As I have said, this may have been facilitated by the fact that both accounts were registered to the same e-mail address. According to the AT&T rep, there were two ways I could fix this. The first was to remove the SIM card from the original iPad and put it in the iPad 2. The second was to have the rep transfer my account data from the original iPad’s SIM card to the iPad 2’s SIM card. I chose the latter method. I gave the rep my iPad’s IMEI (International Mobile Equipment Identity) and ICCID (which is the SIM card’s ID) numbers. You can get these numbers by going to Settings -> General -> About on the iPad. With these numbers in hand, the agent was able to wirelessly transfer my account. When he was done, I had to power off my iPad 2 briefly. After restarting, the iPad 2 had an active 3G connection. The original iPad no longer connected to the Internet via 3G. To avoid further time-consuming hassles, I decided to pay the $15 renewal fee. However, I had the agent disable automatic renewal. My iPad 2’s 3G access should terminate on May 19. Hopefully, all will now work as intended. As a final aside, the agent told me that the SIM card in my original iPad might not work anymore. 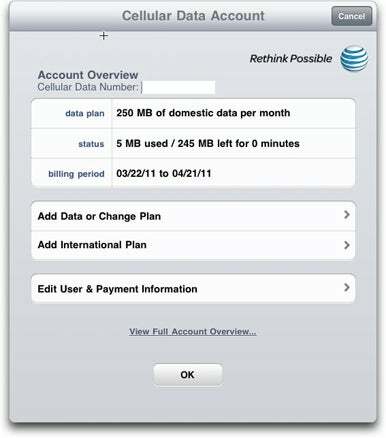 If I later tried to activate a 3G plan on the original iPad, and if the card failed, I would need to get a replacement SIM card from AT&T. I haven’t bothered to confirm this. With my apple cart finally rolling along, I don’t want to risk upsetting it again. Regarding the Mac OS X 10.6.7 font bug I covered a few weeks ago, Apple has released a fix. Snow Leopard Font Update, released Tuesday, eliminates the problems.